i recently read an article on huffington post entitled, "the dark side of free gum." it not only excited me, but it scared me. i felt excitement because of "data, data, data" and i was scared because of "data, data, data". that said, i encourage you to read the article, i'll even wait a few minutes. think about it thought. 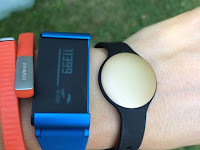 you have this tracker tied to your wrist all day long - it is collecting data about you and your habits all the time. it knows when you're active, and it knows when you're not active, most of them even know when you're sleeping or awake. (they are a digital santa claus!) this data is good for you to discuss with your healthcare professional, but when marketers start to dig into that data, that data has more meaning than just your vital stats. we as marketers, can start to develop customer personas. the marketer in me loves this; the consumer in me just said what, based on my fitness tracker you can build a model of me as a consumer? and then use that against me? armed with this, a marketing professional can then look at this data and build a persona, lumping similar individuals with it, and say -- hey this person is up at 5:45, let's make sure the email campaign we send to him goes at 5:30 that way it's the "top of the box" -- and they will probably read it at 7:00. further you can either prove or disprove that hypothesis by drilling down and correlating open and click through rates and time to that persona. the possibilities of creeping on your customers are limitless. we as marketers have insight into their lives that we never had before. not only that if they use an app with their tracker to track their activities and their diets marketers can take the data and make recommendations for dining establishments based on that persona or even more granular. all of which might not seem creepy to the customer, but it could be perceived as "that's odd" because it's coming from my email, not an app like foursquare or one of the other hundreds of apps individuals have on their smartphone these days. marketers potentially have access to data that we never had before or dreamed about. but in our rush to obtain that data and build out the perfect customer profile, i think a lot of marketers aren't thinking responsibly about that data we have access too. our ethics and morals of marketing aren't keeping up with the sources of data and the speed at which they develop in a world powered by the internet of everything. the other side of this ethics argument is that consumers need to be responsible for their data. consumers need to know what they are getting into. how many of us tell our submitters what they are really signing up for? as an example, how many have gone to have our car fixed and are asked for an email address so that they can send you an email when the vehicle is ready. but they never once tell you that you're also going to be getting emails from the shop about specials and coupons. this has become so commonplace that it is in my opinion a loophole in can-spam requirements because consumers don't/haven't revolted against it. provide your customers with tips and ways for them to be careful about the data that they provide the "internet of everything"